I was about to dock my boat late in the afternoon of Wednesday, June 17, 2015 when I saw a message on my cell phone. When I retrieved it, I found that Chuck Fontaine, the Program Director at Massachusetts Maritime Academy in Bourne, MA, was asking if I could replace a departing coach on their Women’s Sailing Team for the Marion Bermuda Race…two days hence. I called back to get some details, and being the ocean junkie that I am the answer was “YES!” Chuck told me I would be picked up the next morning. Off I went to my tax seminar, as I am a tax accountant. The phone rang as I left the seminar and Lisa Downey, the other coach, told me she would pick me up at 10:30am Thursday and we could get acquainted and she would brief me on the ride up to Marion. Lisa is a racing coach while my expertise is more ocean-oriented with multiple transatlantic crossings and a 100-Ton Master Captains license, so it looked like a fortuitous match-up. 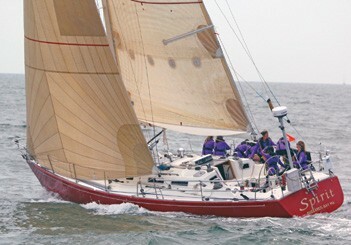 The boat was a J/44 named Spirit, which had been donated to Mass. Maritime. The first incident happened 48 hours after the phone call, while I and the watch I was mentoring were on deck. It was dark and boat was going really well, when we heard a loud flutter of wings. Startled, there was a bit of screaming and when we shined a light on the noise we found a large cormorant on the cockpit sole. This being not my favorite bird, I put my gloves on and pitched the hitchhiker back out into the darkness. The second incident occurred the next morning. Our watch came on deck and Lisa pointed out that there appeared to be a bubble in the main near the head of the sail. We discovered there also were some tears in the laminate. We decided that we needed to take the main down and try to repair it with the tape and patches that were on board. The crew worked feverishly trying to patch the major defects. There were many discovered as we got a closer look at the sail. Meanwhile, many of the boats we were ahead of passed us, including the other boat crewed by women, Anne Kolker’s Stellar 52 Étoile. After raising the repaired sail we continued for a while but then the sail said, “I am tired, I am old and I quit.” It totally delaminated, but the taped edges held and we were able to lower it and tie it onto the boom with the shredded Kevlar fibers looking like a bad wig. We were only 24 hours out. After some discussion as to the pros and cons of retreating to Marion or forging on, it was decided that there was no significant safety risk…although we still had the tropical depression Bob ahead of us. The women were adamant that they wanted to continue. We put on the tiny storm trysail to replace the mainsail. The crew commented that it was smaller than a 420 sail. Off we went. Mother Nature favored us with reaching winds, and we had plenty of headsails in the inventory. We did lose some speed and pointing ability but we were moving well under the circumstances. Then mal de mer hit, not unusual at this stage and in spite of many patches for seasickness on the crew. Seven of nine were affected, but as is often the case on an ocean passage the third morning is a charm and everyone became acclimated to living with the motion. Since we couldn’t point as well as we might have, we were pushed further west than we had planned. By the middle of the day we landed in the Gulf Stream and met Bob. Winds were mostly in the thirties, but the boat was riding beautifully as we still were on a broad reach. 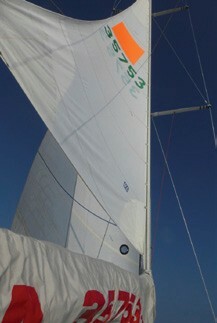 We rode the waves pretty comfortably, and ironically the sail configuration was fine for these conditions. The waves were big, but running in the right direction. In many ways it was an exhilarating ride. 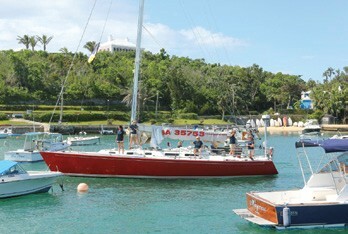 We continued toward Bermuda and also met some of the other boats, so we felt confident we would not finish last. The wind went lighter early the next day and the women did a lovely inside-outside change up to the number one headsail. Lisa and I watched the excellent crew work from the now well-experienced crew. The evening of day four found us in a tight race with two other boats to round the buoys approaching Bermuda. The crew and Lisa called the tactics, and we managed to pass and beat them to the finish line. Since it was now dark, we anchored in St. Georges Harbor. Tired, we all slept well. We made our way to Hamilton in the morning. Upon arriving and docking next to the Mass Maritime Academy men’s boat, the women were greeted by cheers and congratulations from the men for finishing under the difficult circumstances and were feeling really good about themselves. Lisa and I felt really good for them as well. This race was, in a sense, a better learning experience because the team dealt with a major breakdown and a storm…plus our unwelcome hitchhiker. Yes, we only beat one boat in our division but we finished well in the fleet (25th out of 32) under the conditions. They merited a great deal of praise for continuing on and finishing. 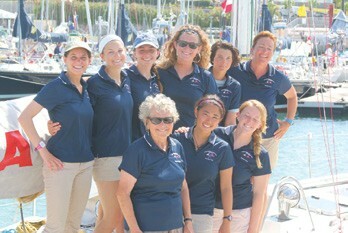 No one could say the Massachusetts Maritime Women’s Sailing Team was a bunch of wimps. These women rocked! A member of the Cruising Club of America, the Ocean Cruising Club, Cedar Point Yacht Club and the Penfield Power Squadron, Carole Heller lives in Fairfield, CT. She and her husband Warren enjoy sailing their Pearson 323 Sublime.